Mr Skidmore met over 20 London EdTech companies who are working with UCL researchers on a range of projects, from using AI to speed up language learning to building social confidence in school students. The projects are part of a UCL programme called EDUCATE, which connects start-ups and business developers with leading experts in education and technology. It aims to use research-based evidence to develop 250 businesses which will help students and teachers and have a lasting impact in education. The visit follows the recent announcement by Education Secretary Damian Hinds of the Government’s forthcoming EdTech strategy and £10 million fund to support innovative uses of technology in schools and colleges across England. 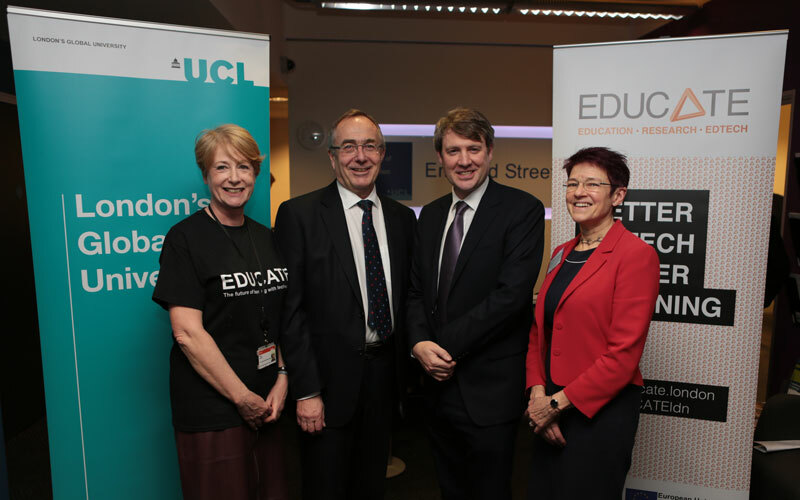 The EDUCATE programme was launched in early 2017 by Professor Rose Luckin at the UCL Institute of Education’s Knowledge Lab which is part funded by the European Development Fund and its partners BESA, FS6, Nesta and UCL Engineering and has attracted interest and inquiry from EdTech developers in the UK and overseas. To date it has worked with more than 170 start-ups, SMEs and entrepreneurs. During the visit to Mr Skidmore met with the founders of new companies including Little Bridge, Connect2Teach, Confident Beans and Interactive Scientific. With the support of UCL, these entrepreneurs are designing products which will help teachers and learners interact with digital platforms to help students work collaboratively, manage workload and build confidence and ability. Emma Little, founder of Little Bridge, an on-line learning platform where children from all over the world can meet and chat to each other and, at the same time, learn English, said: "When we began developing Little Bridge, we were aware of the connection between learning, social media, and accessibility and affordability aspects of the product.